While it may not be ranked as high on top travel destination lists as cities like Miami, Appleton is a beautiful, vibrant city with lots to do, see, and explore! Once you know where to look, you�ll be overwhelmed with the possibilities on your next trip. Here are our top things to do in Appleton, WI! Downtown Appleton is bustling with local shops, boutiques, and hidden gems! 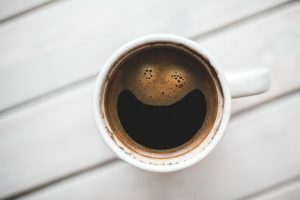 By car, you just may miss out on checking out your favorite new place to grab a bagel and a cup of coffee, or the boutique with the perfect dress for that upcoming event. 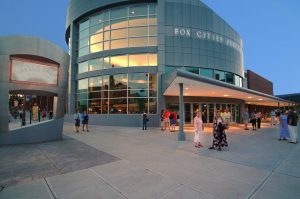 Downtown Appleton�s premier venue for live performing arts, the Fox Cities PAC regularly puts on Broadway quality theatrical productions of both new and old favorites. With new shows rotating in every month, there is always something to see and fun to be had! Locally owned and operated, Copper Rock has been serving mugs of �liquid sunshine� since it opened its doors in 2002. While the beans are globally sourced to ensure you receive the utmost of quality, each bean is locally roasted. If you�re also looking for a bite to eat, the cafe also offers a full menu with many unique soup, salad, and sandwich items. Be sure to stop by this local gem on your next trip! Explore the streets of Appleton in a whole new way! One of Appleton�s newest downtown attractions, Social Station allows you to pedal the streets of the city, along with 14 long time friends, new friends, or family members! Whether you�re a vino, a craft beer fanatic, a food or fitness junkie, there is a pedal tour that is right for you! Immerse yourself in the history of the area with a trip to the History Museum at the Castle! With exhibits and artifacts dating all of the way back to the 1840�s, this downtown Appleton museum is sure to please curious travelers and �history buffs� alike. While you explore the exhibits, be sure to not miss out on one of the museum�s main attractions: AKA Houdini – a hands on magical experience that allows you to experience some of the �tricks� of one of history�s greatest magicians, Harry Houdini. An absolute must see, this globally recognized bar made its claim to fame with its year-round Christmas theme. 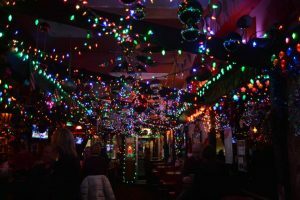 The bar is adorned with a miraculous amount of holiday decorations – so many that even anyone�s Christmas-crazed, hoarding grandmother would be envious! (Seriously – this photo, compliments of Cleo’s Bar, doesn’t do it justice!) And when you stop in, be sure to order their signature drink, the Dirty Snowball. Just across the street from the CopperLeaf, Vince Lombardi�s Steakhouse offers an upscale menu with an atmosphere that any NFL fan can enjoy! 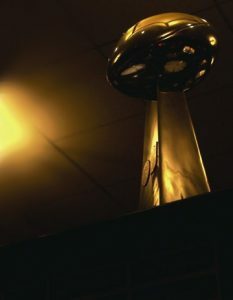 Originally opened by Vince Lombardi himself, the restaurant features over 200 articles of Green Bay Packer and NFL memorabilia. A small Liberal Arts college known for its academic excellence, beautiful campus, and community involvement, Lawrence University is a must see when visiting Appleton, WI. Founded in 1847, the campus features many gorgeous historic buildings – perfectly melded with new technologies to provide a great learning environment for 1,500 students. The university often hosts events that are open to the public, so be sure to check their event calendar to see all that is available during your stay. Appleton is a lively city, full of attractions, activities, and culinary delights that are sure to delight even the most seasoned traveler. For more information on all that you can do throughout the city, stop by the front desk on your next stay at CopperLeaf Hotel to receive a full itinerary! CopperLeaf Boutique Hotel is one of the premier hotels in Appleton, WI. Modeled after small, family owned and operated European hotels, you will be indulged with personalized service in a warm, inviting, and unique atmosphere. This entry was posted in Local Events & Attractions. Bookmark the permalink. Copyright ©2019 CopperLeaf Hotel. All rights reserved.